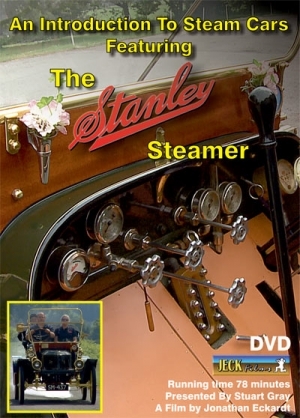 An Introduction To Steam Cars - featuring "The Stanley Steamer"
Steam Cars! How, what, when. Stuart Gray, well known in the steam fraternity and owner of various steam vehicles, introduces us to steam cars from there earliest days in the latter part of the 19th Century and how they developed during their heyday. By the late 1920’s steam cars had virtually disappeared in favour of the internal combustion engined automobile, yet their fascination continues along with the debate and arguments as to whether they could have ever been a viable alternative. The aim of this film is not to provide a definitive history, but following a brief introduction, to feature on the most popular steam car of all, The Stanley Steamer and how this car, with only 13 moving parts in the engine, actually worked and to take away some of the mystique that surrounds the large number of controls and gauges in front of the driver. Was it really so complicated that the chief difficulty was to devise a means of generating and utilizing steam in such a way that it might be placed in the hands of a person of ordinary intelligence without danger to himself or others?